We are the experts in house clearances in the Retford area. Clearing houses have been our business since 1974. 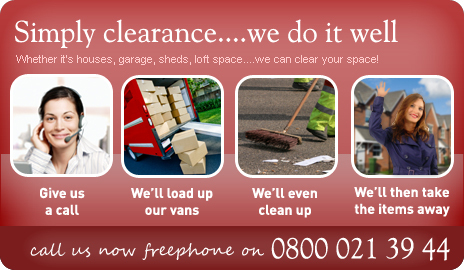 You want a house clearance service that is 100% hassle free, professional & discreet. You get a hassle free service that will clear your property in approx 3 to 4 hours, you get a professional friendly team that will show on the day with a large luton van and a large trailer. You want a house clearance company that turns up on time on the day of our appointment to your residence and is finished the clearance within a few hours. You want a house clearance company that will disconnect any appliances if needed, clear all unwanted furniture, bric-brac, lofts, sheds, garages and lift and remove carpets. You want a house clearance company that will give you a legitimate invoice containing all of our business and tax details once your house clearance has been completed. We do not do cash in hand so please do not ask!